Central Alabama is getting its first significant snowfall since 2000, and hubby and I are enjoying a quiet and relaxed day of the white stuff. Behold. To the left are our cars, Betsy and Gladys. 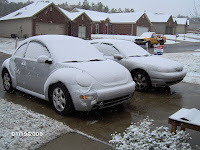 Interestingly, the snow on the Bug's hood has slipped to the ground, but Gladys' hood rendered a bounty of clean snow for making snow cream. I used Michelle Malkin's recipe but substituted evaporated milk for the regular milk. Even better! I am now threatening to break out the cocoa, evap milk, cinnamon and cayenne for some righteous Mexican-style hot chocolate, and hubby is very happy about this. Meanwhile, microwave 1 cup of evaporated milk on high for 1 minute or until hot but not scalding. Pour the heated milk into the mug, stirring briskly to combine the dry ingredients with the milk. Add freshly ground cinnamon, fresly ground nutmeg and cayenne pepper powder to taste. Finish with a dash of vanilla extract. Oddly enough I'd never had snow cream before; generally the snows I enjoyed up north were more shovel technique honing opportunities than snowball-and-sledding-enjoyment days. It's neat to see how Alabamians are making the most out of the first real snow they've had here since 2000.